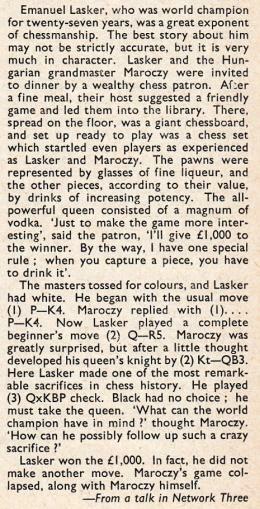 The only 2 Qh5 game we can recall seeing in print is E.E. Southard v H.B. Hill (in a Boston v New England match), which appeared on pages 112-113 of the January 1907 issue of the Chess Amateur. White won in 27 moves. The annotator, W.P. Turnbull, writes of 2 Qh5: “The Danvers Opening. Not so bad as it looks.” After 2...Nc6 3 Bc4 Qf6 he says that 3...Qe7 may be better, reserving f6 for the knight, or 3...g6. The game continued 4 Nc3 Bc5 5 Nf3. Turnbull asks whether White could have played 5 Nd5, giving as a possible sequel 5...Qxf2+ 6 Kd1 Qxg2 7 Nxc7+ Kd8 8 Nxa8 Bxg1. Where does ‘Danvers’ come from? 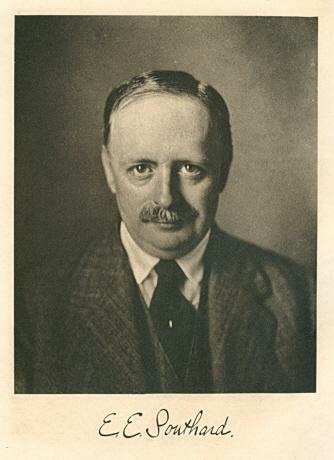 From Gaige’s Chess Personalia: Harlow Bussey Daly, born in Dorchester, MA on 2 December 1883, died on 8 July 1979 in Framingham, MA. The Massachusetts connection may be relevant, since Danvers is a town in that state. Found at last: the origin of the name ‘Danvers Opening’ (1 e4 e5 2 Qh5). It is easy to imagine the above finding its way into many a future chess trivia quiz (‘What opening was named after an institution for the insane?’). The Southard v Hill game referred to in C.N. 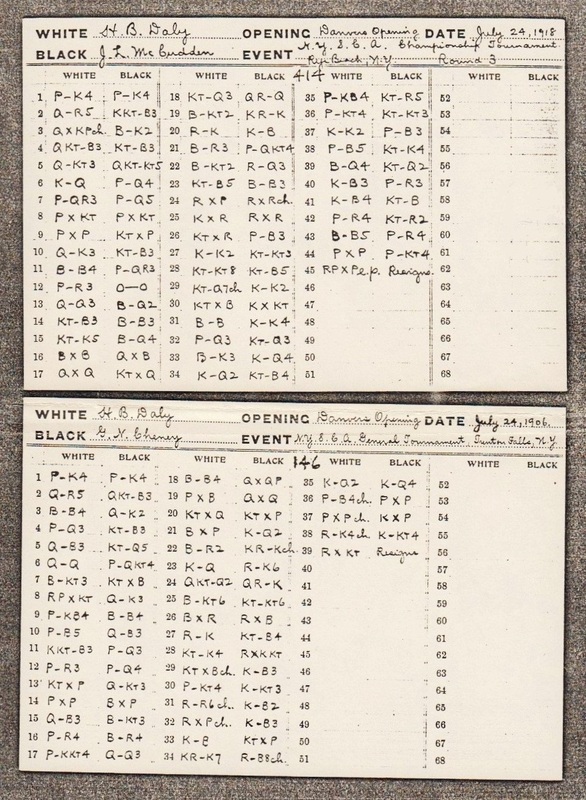 1382 was played at Boston on 30 May 1905, and in the same (40-board) match a game between G.T. McClure and F. Mathewson opened 1 e4 e5 2 Qh5 Nf6 3 Qxe5+ Be7 4 Nc3 Nc6 5 Qf4 O-O 6 Be2 Bd6 7 Qe3 Re8 8 d3 Be5. Black resigned at move 42. 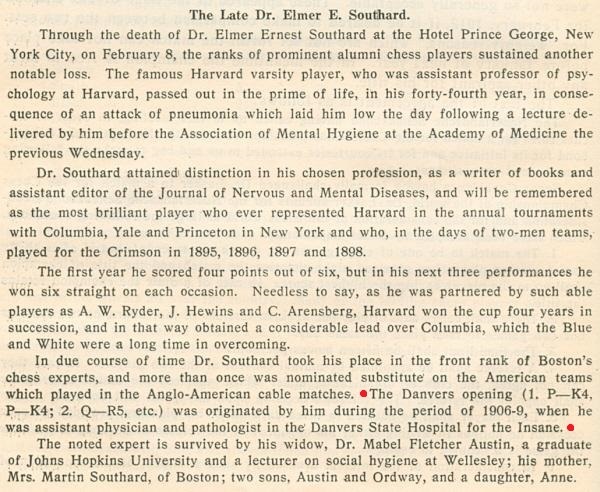 Source: American Chess Bulletin, July 1905, pages 253, 254 and 258. 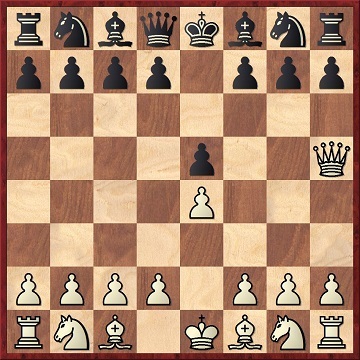 An article entitled ‘Ein Gambit gegen 1 e4 e5 Dh5! ?’ by Maurits Wind was published on pages 44-47 of Kaissiber, issue 30 (January-March 2008).